The Texas Longhorns have been the majority winner of the Big 12 since Nebraska has left the league, and it shows once again in the preseason awards for the 2018 season. Leading into the list of preseason All-Big 12 honorees are the two awards, which both are going to the Longhorns. Leading the charge is junior outside hitter Micaya White, who earns Big 12 Preseason Player of the Year after she was All-Big 12 First Team in both 2016 and 2017. She was also just one of three players voted as a unanimous choice. 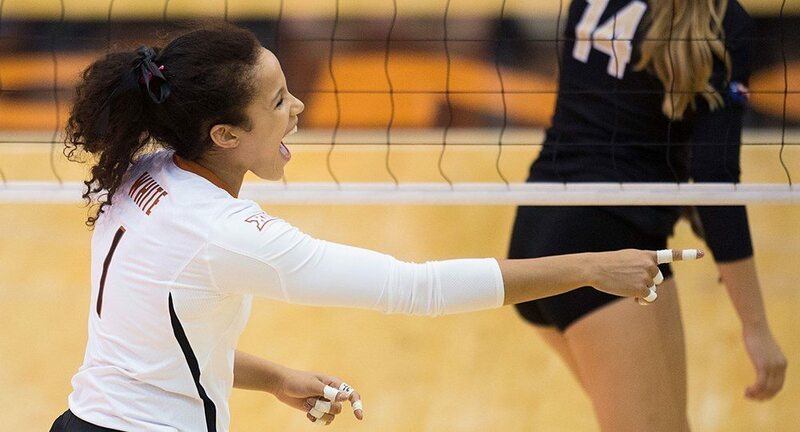 The other Longhorn awardee outside of the list is Preseason Freshman of the Year Logan Eggleston, who just starred for Team USA in the NORCECA U20 Continental Championship and graduated early to join the collegiate ranks. In terms of others like White who made the preseason team after winning postseason awards in 2017, MB Shelly Fanning (Baylor), OH Yossiana Pressley (Baylor), L Hali Hillegas (Iowa State), OH Jess Schaben (Iowa State), OH Alyssa Enneking (Oklahoma) all fit the billing of returning 2017 All-Big 12 First Team performers. Of the 15 women group, seven others graduated and two transferred away, leaving those six. Additionally, S Hannah Lockin (Baylor), OH Jada Burse (Kansas), MB Anna Walsh (TCU) and S Missy Owens (Texas Tech) were on the 2017 All-Big 12 Second Team and appear on this preseason list. The players who made the team without playing for their school are RS/S Gabby Simpson – who transferred in and redshirted in 2017 out of Colorado – and S Kylee McLaughlin – who also comes out of the Pac-12 as a transfer from Oregon State. The others remaining are MB Grace Lazard (Iowa State), OH Kylee Zumach (Kansas State) – who was All-Big 12 First-Team in 2014 – and MB Morgan Johnson (Texas).